Hello again, lovely blog readers! 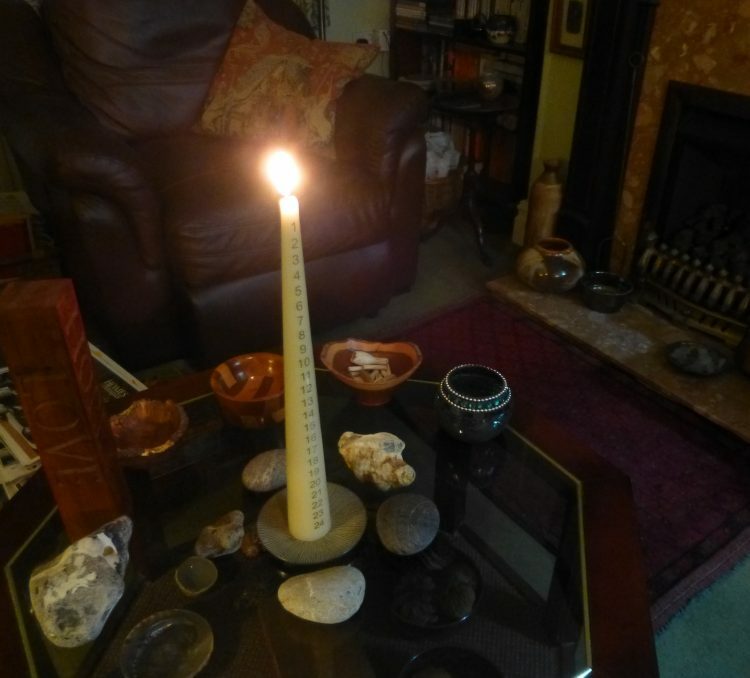 I’m glad to be back in time to wish you a very happy Winter Solstice, after a long, and unexpected blogging gap. 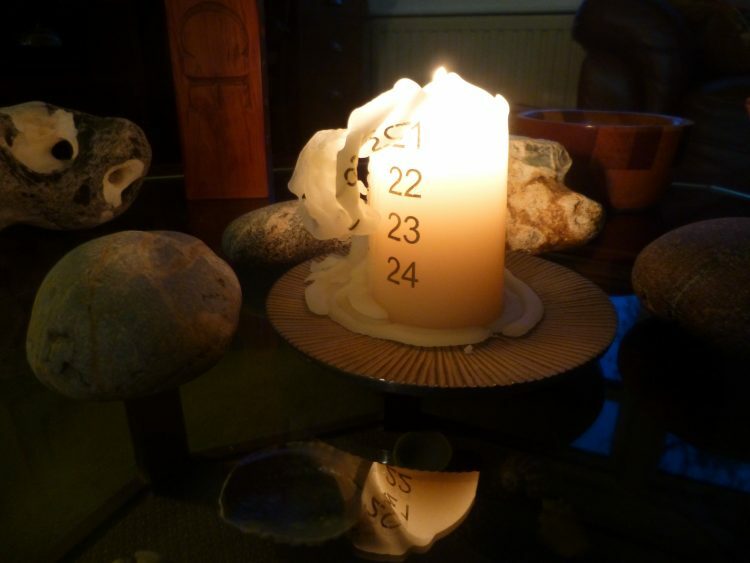 My Advent Candle is almost burnt down, just three more days to go before Christmas Day. This is what it was like on December 1st . . . The days in between have been spent recovering from a major operation, for the last three months did not go at all how I’d planned! Far too many visits to the hospital. Ultrasound scans, ECGs, blood tests, an MRI scan, a hysteroscopy under general anaesthetic, and then a cancer diagnosis on 19th October! And that led to a total hysterectomy on 14th November, and the good news a couple of weeks later that I needed no further treatment and was completely cured! During this difficult time I have had an enormous amount of support from a great many people, particularly Graham and my sister, and I’ve had lots of people praying for me which I have found very strengthening. I am so grateful to them all. My GP, and the consultants and nurses, particularly my clinical specialist nurse, were all brilliant. We read so much in the press complaining about the NHS, and yet from the time I first went to my GP to the time I had my operation was less than 2 months – I think that’s pretty impressive. Since the op I’ve been making a remarkably good recovery. 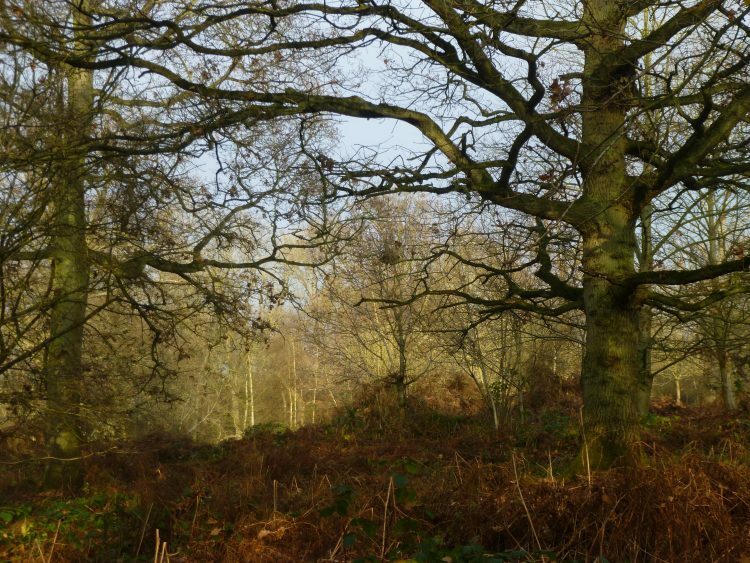 I started driving again on Monday, and felt well enough yesterday to make my December visit to the wood. The sun came out while I was there! 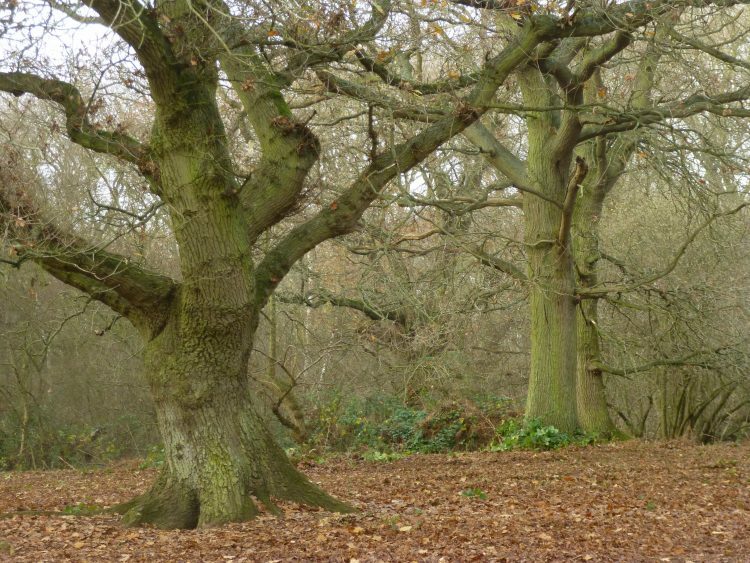 The wood seemed very quiet and open and bare, with green moss on many of the tree trunks. I saw several robins, and heard the harsh cough of pheasants. 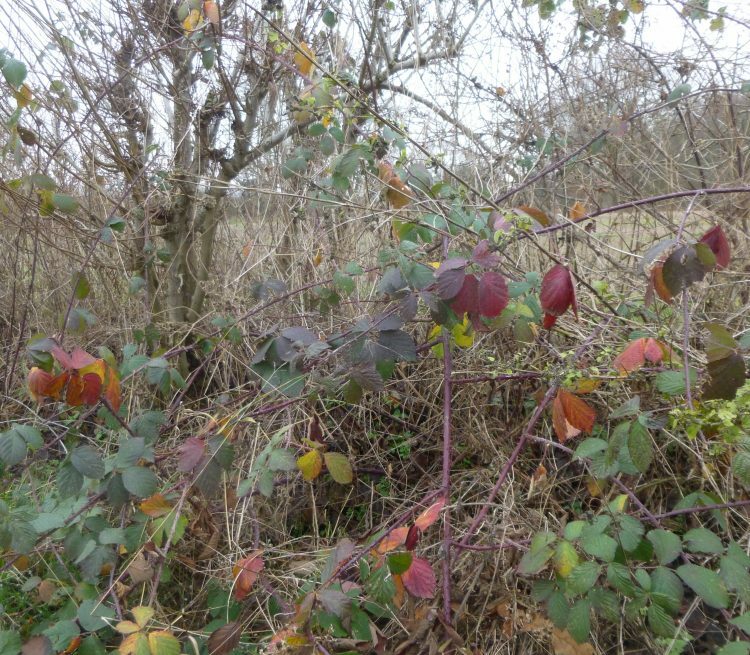 Some of the bracken was still green, and the brambles showing wonderful rich colours. The Woodland Trust had evidently been doing some work in the wood, and a lot of the bracken was cleared from under the big trees. I could really see the forms of some of these great oaks. My two aims in recovery were – to be well enough to walk round the wood before the end of December, and to get back to singing before Christmas. And I was well enough to sing for the Carol Service at St Mary’s at Wivenhoe on Sunday evening. So, although Christmas will be rather quiet this year, as I am still getting quite tired, when I think back over the last few months I am amazed at how well I am – it could have been a very different story.